You might not be able to actually be the Batman, but you can totally drive his car. As nerdy cars go, the Batmobile from Adam West's time as the Caped Crusader in the 60's is probably one of the most recognizable, right up there with the DeLorean from Back to the Future and KITT from Knight Rider. And now, if you've got the cash, you can have an official, working replica of your very own. DC Comics has granted Fiberglass Freaks the rights to make official replicas of the classic car. Each replica is a mixture of features you'd expect to find on a luxury car, like a high-end sound system and a built in DVD player, and wonderful details like a working flamethrower exhaust and custom made bat-spinners mounted on the wheels. Each replica is built around the frame of a 1970's Lincoln town car that Fiberglass Freaks provides, and is a fully working vehicle besides being very accurate to the show. You'll need fairly deep pockets in order to get one though, as each replica costs $150,000 and only eight will be made each year. 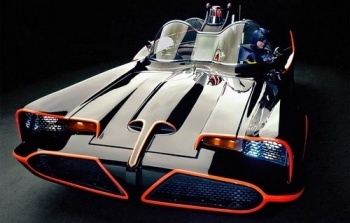 Fiberglass Freaks' founder Mark Racop is considered to be one of the leading experts on the '66 Batmobile, and has been a fan of the car since he first saw it in 1967. His whole company built up around his desire to own a Batmobile of his very own, and he describes building them as a "passion." Now, hands up anyone who isn't thinking "atomic batteries to power, turbines to speed."